Today in Masonic History Hyrum Smith passes away in 1844. Hyrum Smith was an American religious leader. Smith was born in Tunbridge, Vermont on February 9th, 1800. 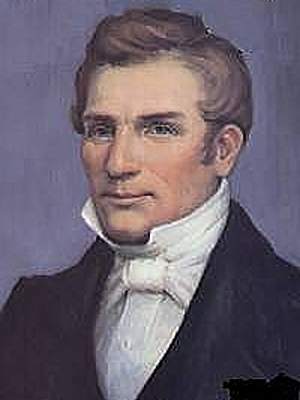 He was the second son of Joseph Smith, Sr. and the younger brother of Joseph Smith, Jr, founder of the Church of Latter Day Saints (CLDS), the Mormons. Hyrum Smith had little education and established himself as a farmer. He did attend Dartmouth College in his teens. Smith was directly involved with his brother Joseph as he was establishing the CLDS. Hyrum was one of the eight witnesses that testified to the reality of the golden plates that Joseph said that he was directed to find. The translation of the golden plates would latter become the Book of Mormon. In 1829, Hyrum was batized in Seneca Lake, New York. In 1830 six men signed their names as charter memebers of the CLDS. Hyrum was the oldest. Hyrum served as the presideing officer of the branck of the church in Colesville, New York. He was also a missionary for the church in the surrounding areas. In 1831, the headquarters and the church membership began moving west. Hyrum took his family and moved to Kirtland, Ohio. There he was the foreman of the quarry that provided stone for the Kirkland Temple. He also starting from 1831 until 1833 he served proslyting misssions in Ohio and Missouri in an attempt to gain new members for the church. In 1834, under his brothers direction, Hyrum organized a militia for the church called Zion's Camp. This was to counter violent encounters that had been occuring in Missouri between CLDS settlers and others who had already attempted to settle the region. In 1838 and 1839, Hyrum, his brother and three other chruch leaders shared a cell in Missouri after they were arrested when violence ensued between Zion's Camp and local settlers. In 1837 Hyrum was appointed by his brother as Second Counselor in the Church's First Presidency. When they were released from jail in Missouri, Hyrum and his brother moved to Nauvoo, Illinois. There Hyrum was appointed the First Patriarch of the Church, a position that was previously held by Hyrum's father. Hyrum was also appointed as Assitant President of the Church putting him in a position to be in charge of the church if anything happened to Joseph. Joseph shortly after warned Hyrum about impending danger and urged his brother to move with his family to Cinncinati. Hyrum refused and in 1844 the two traveled with two other chruch leaders to Carthage, Illinois. There the four men with were charged with riot and treason and were placed in jail again. On June 27th, 1844, the building was attacked by a mob. The four men tried to baracade themselves in the building with no luck. As the mob was coming through the door, Hyrum was shot in the face and exclaimed, "I am a dead man." Both Hyrum and Joseph were killed in the attack. Hyrum Smith was a member of Mount Moriah Lodge No. 112, Palmyra, New York.